A goal on the hour by Jeff Smith proved to be the decisive moment as Bishop Auckland edged a closely fought encounter against Ashington at Heritage Park on Friday night. The defeat brought an end to a brief run of two straight wins for the Colliers. 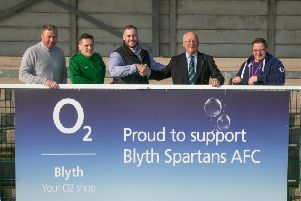 And shortly after Smith’s strike, Ashington had to play the final half hour with only ten men after striker Andrew Bulford was sent off for a challenge near the touchline. It took nine minutes for the first semblance of a chance, which in turn signalled a flurry of action, as Lee Scott teed up a volley for himself but directed it narrowly over the bar. Visiting keeper Conor Grant fielded a shot from Scott McCarthy then Bishops’ Andrew Johnson cut inside but dragged his effort wide. At the other end, a 25 yarder by Kyle Oliver was held by keeper Edward Wilczynski. A back pass from Ryan Bell to Grant saw the stopper’s clearance cannon off Johnson to go wide, and then Adam Nicholls slotted the ball through to McCarthy who guided his shot wide of Grant and towards the goal until James Harmison cleared off the line. Midway through the half a free kick by Grant bounced high and almost caught out his opposite number who eventually clawed the ball away to safety. A 35-yard effort by Oliver was taken by Wilczynski before the best opening for either side came seconds from the break. Scott glanced on a clearance from Grant which put Bulford clean through but the striker fluffed the opportunity, clipping his lob wide of the advancing keeper from 25 yards. It was the two blues who broke the deadlock when Johnson found Smith who applied a cool finish from six yards wide of Grant and inside the far corner. In the next minute, Bulford was in a threatening position but his progress was checked by a superb tackle by Ross Colquhoun. Shortly afterwards, Bulford was again in the thick of the action, but for all the wrong reasons. He pursued Thompson before making a rash tackle and was immediately shown a red card by referee Simon Clayton. Johnson converted a cross from the left by Smith but the goal was ruled out for offside, then Ashington pressed and after a Johnson free kick was deflected behind for a corner, Michael Dixon blazed over. In a grandstand finale, Dixon cleared to safety after Johnson had rounded Grant before the keeper pulled off a terrific double save from substitute Ian Ward and the follow up from Priestley Griffiths. Smith also went close, then three minutes from time, sub Ben Harmison spotted Wilczynski off his line and tried an audacious lob but the stopper got back to snuff out the danger. Ashington: Grant, Christensen, Oliver, Taylor (Stevens 55), J Harmison, Bell, Trodd, Dixon, Bulford, Scott (B Harmison 66), Johnson. Subs not used: Dunn, Gunn, Grieve. On Saturday Ashington are away to North Shields then on Wednesday, March 30, the Colliers travel to Cumbria to face Penrith.